Highly pigmented colors, Long lasting without touch-ups, Contains nourishing emollients, Smooth texture. 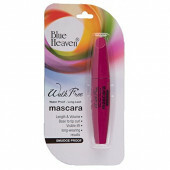 Blue Heaven brings you another great accessory which enhances your appearance. Xpression Lipstick makes you look beautiful instantly. An attractive golden coloured packaging make this lip stick standout from the ordinary. Soft textured lip colour is infused with emollients which provides moisture to your lips. Spreads like heaven on your lips and does not feel heavy. Delivers high pigmented colour which lasts for hours.